Buying or selling a home takes a considerable amount of time, energy and expertise. Yes, today there’s a lot more information available to buyers and sellers. However, without the assistance of a licensed real estate agent not everyone can handle the dynamics or emotion of, what is for most, the largest financial investment they will make: purchasing a home. 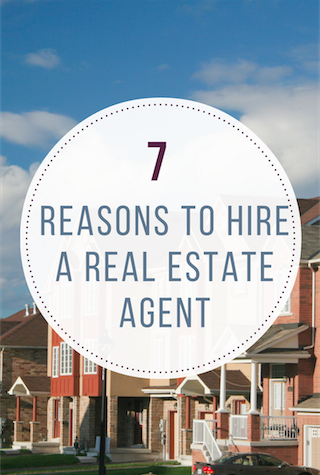 Here’s why you need to hire a real estate agent. Real estate agents know their markets and home values. They understand market conditions and known facts like cost per square foot, median sales prices and average days on market. They are the objective party; they are not as emotionally invested in the home as you rightfully are. As a buyer, you will be coached by an agent on making a reasonable purchase offer and as a seller on listing at a price that will sell your home quickly and for top dollar. When selling, an agent can list your home on the MLS-Multiple Listing Service–a database of homes for sale with detailed information. Real estate agents rely on the MLS to guide both buyers and sellers. In fact, some agents only show homes on the MLS because they know they will be dealing with another real estate professional and not an inexperienced personal home seller. You’ve listed your home For Sale by Owner. Now imagine taking time off from work and a prospective buyer is a no-show after non-stop texting and phone tag. That’s annoying. Or, you’ve canceled your out-of-town weekend plans for a scheduled showing only to discover the prospective buyers aren’t seriously interested in your home. They’re “just looking.” If you’re a seller, an agent will bring you serious, qualified buyers who won’t waste your time. Enlisting the services of a real estate agent is a convenience that cannot be overlooked. Agents know the neighborhoods in their market. They identify comparable sales and can provide demographic data and statistics on crime, schools, etc. They know market values and even are often aware of upgrades or hazards of individual properties. They have access to more information and properties than you do. What would take you hours to access, they have at their fingertips. Not all real estate transactions are diplomatic. Some are tough. What happens if there’s a dispute or disagreement about terms and you aren’t working with a real estate agent? An agent is the middle person between the buyer and the seller who can smooth things over. The agent asks the tough questions and advocates on your behalf. As an example, are there items that need to be fixed before closing? Your agent will follow up to ensure these are completed to your satisfaction. This is just one priceless benefit of working with a licensed real estate agent. One of the most important roles of an agent is ensuring that all contracts and other legal paperwork are correct and in order. There are mounds of forms, documents, disclosures and other reports to complete. It requires expertise with a jargon or language of its own. Not being properly educated on this paperwork can result in costly, and timely, mistakes. Your chances of winding up in court or in litigation are lessened when working with a seasoned, licensed real estate agent. Seriously. When is the last time you have had to negotiate a high dollar, long-term investment deal? Realtors do this regularly. Good ones know when to get tough and when to charm. In a competitive market, you need a professional, skilled negotiator working with you to get the highest dollar for your home for sale and/or to help you secure the home of your dreams for the best price. Realtors are networked with other community professionals. Need a few minor fixes before listing? Your agent can refer you to skilled workers who will do the job well. Seeking a mortgage? Agents have lists of lenders to refer you to. They know who has a local reputation for efficiency, quality, and competitive pricing. If time is money, you will always come out ahead by enlisting the services of a licensed real estate agent. Also, it’s not uncommon for buyers to lowball offers on a home listed For Sale by Owner because buyers know the seller is not paying a realtor commission. Finally, imagine the horrors of legal fees after the sale if it’s discovered there is a problem with either, or both, the home or the paperwork. The advice and counsel of a real estate agent is always worth it. Save yourself time, stress and money. Always enlist the services of a licensed real estate agent when buying or selling a home. Are you ready to list your home or start looking for a new home to move into? ©Copyright. January 2017. Megan Owens.